NASCAR is in Las Vegas for the annual Monster Energy Cup Series event, and this week racing’s premiere circuit provided fans in Nevada with some added reason for excitement. 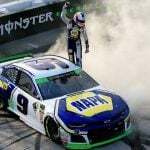 Yesterday, NASCAR (National Association for Stock Car Auto Racing) announced that beginning in 2018 the Cup Series will make two trips to the Mojave Desert on an annual basis. The second race will become part of the 10-race season ending playoffs. 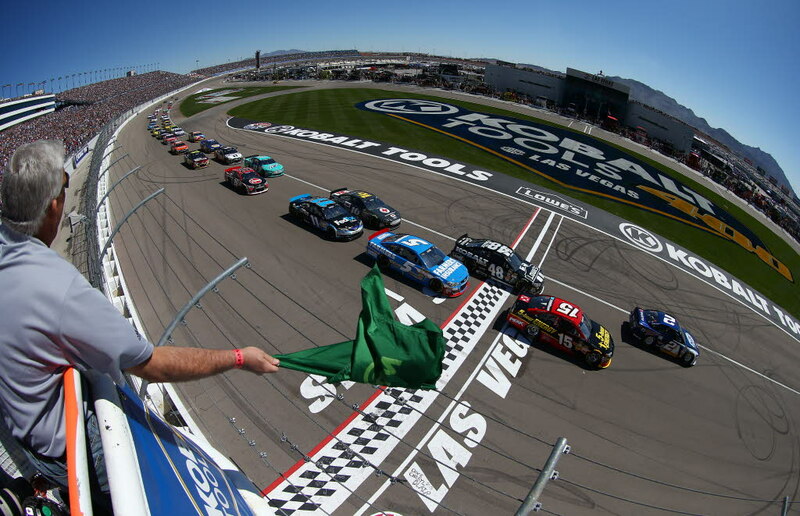 “Las Vegas and Las Vegas Motor Speedway (LVMS) have become great destinations for NASCAR,” NASCAR Executive Vice President Steve O’Donnell said in a statement. 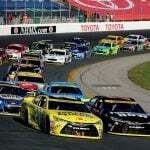 The NASCAR series consists of 36 races, but about half of the events are held in the southeastern United States. The powerful cars fly around tracks at speeds upwards of 200 MPH. As for this Sunday’s Kobalt 400 at LVMS, Kevin Harvick, the current Monster Cup Series points leader, is the favorite at 4-1. He’s followed by Brad Keselowski at 5-1, and Jimmie Johnson, Chase Elliott, Joey Logano, and Kyle Busch at 6-1. The odds are provided by Boyd Gaming, which is the title sponsor for Saturday’s 300 race. The Westgate SuperBook also has Harvick as the favorite, but at only 5-1. Keselowski posts 6-1, with Johnson, Elliott, Logano, and Busch at 7-1. 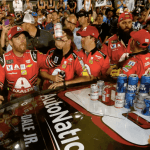 NASCAR isn’t exactly the most popular sport at Las Vegas books, but Vegas hosting two annual Cup races could help attract more wagers. It’s an exciting time for Las Vegas sportsbooks. Not only is an influx of visitors descending on Sin City for the NASCAR races, but March Madness also tips off next week. Casinos and books will be busy, and that’s good news for Las Vegas. Last year, the Kobalt 400 drew 114,000 fans to the LVMS, 96,400 reportedly non-Vegas residents. The NASCAR race is also estimated to provide an $82 million boost to the Vegas economy. The 1.5-mile oval track is located at the northeastern tip of Las Vegas, roughly 15 miles from the Strip. The majority of NASCAR fans shun the luxurious resorts like the Venetian and Wynn in favor of more economic options such as Sam’s Town, Stratosphere, and Fremont Hotel. Las Vegas has historically been a city all about gambling, and little about sports (other than the betting). But that’s quickly changing. The NHL is bringing Vegas its first major professional sports franchise beginning in 2018 with an expansion team named the Golden Knights. Oakland Raiders owner Mark Davis is also trying to move his football team to Nevada, and the commissioners of the NBA and MLB have both recently commented on easing their leagues’ previous anti-sports betting policies. Now with two annual NASCAR races, professional hockey, and likely the NFL in the coming years, Las Vegas is ready to welcome a new demographic of potential visitors. Casinos have been in the process of trying to figure out how to attract the millennial, the sought-after generation that isn’t keen on games of pure chance. More sporting events will help in that mission.